Today, CIRM-funded scientists from the UCLA Broad Stem Cell Research Center reported in Nature Medicine that hematopoietic stem cells (HSCs) – blood stem cells that generate the cell in your blood and immune system – get a helping hand after injury from cells in the bone marrow called bone progenitor cells. 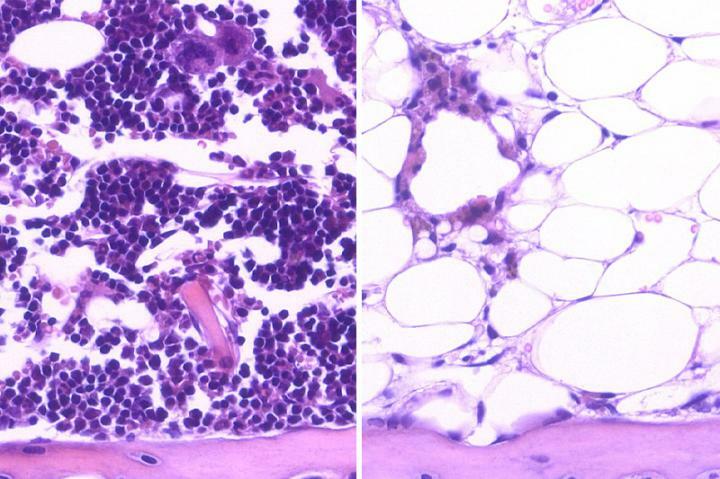 By secreting a protein called dickkopf-1 (Dkk1), bone progenitor cells improve the recovery and survival of blood stem cells in a culture dish and in mice whose immune systems are suppressed by irradiation. These findings build upon a related study published by the same UCLA team last month showing that deleting a single gene in HSCs boosts blood stem cell regeneration. We covered this initial story previously on the Stem Cellar, and you can refer to it for background on the importance of stimulating the regenerative capacity of HSCs in patients that need bone marrow transplants or have undergone radiation therapy for cancer. Senior author on the study, UCLA Professor Dr. John Chute, wanted to understand how the different cell types in the bone marrow environment, or niche, interact with HSCs to enhance their ability to recover from injury and regenerate the immune system. As mentioned earlier, he and his team found that bone progenitor cells secrete Dkk1 protein in response to injury caused by exposing mice to full body irradiation. Dkk1 promoted blood stem cell regeneration in the mice and increased their survival rates. I inquired with Dr. Chute about this seemingly beneficial relationship between HSCs and cells in the bone marrow niche. Not only did Dkk1 improve HSC regeneration in irradiated mice, it also boosted the regeneration of HSCs that were irradiated in a culture dish. On the other hand, when Dkk1 was deleted from HSCs in irradiated mice, the HSCs did not recover and regenerate. Diving in deeper, the team found that Dkk1 promotes blood stem cell regeneration by direct action on the stem cells and by indirectly increasing the secretion of the stem cell growth factor EGF by bone marrow blood vessels. Taken together, the team concluded that Dkk1 is necessary for blood stem cell recovery following injury/irradiation. Both studies offer new strategies for promoting blood stem cell regeneration in patients who need to replenish their blood and immune systems following radiation treatments or bone marrow transplants. dickkopf-1??? Really?? Did the team who named this protein not know that “kopf” in German means “head”? ?